The conversation on student loans continues with Jay Fleischman an expert on you guessed it student loans! If you did not listen to Episode 68, do that first by clicking here. 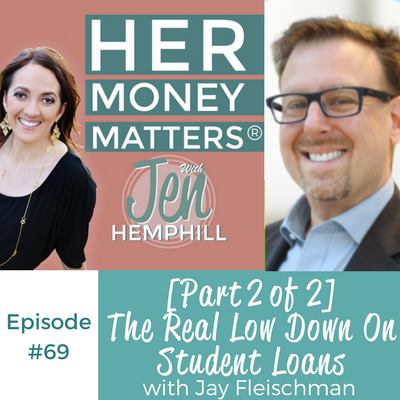 [00:00:25.8] JH: Hello there and welcome to Part II of this two part series, all about the real low down on student loans with Jay Fleischman. Now if you have not heard Part II, go back to episode 68. You can find that on iTunes everywhere or just simply go to jenhemphill.com/68. So I would start there if you haven’t done so. So don’t listen to this part first, go listen to Part II that way you get to know Jay and his story as well. Now this episode is also jam packed, so if you can and if you have the ability to make sure you take some notes, that’s for sure. But if you’re driving, riding a bicycle, taking your dog for a walk out with the stroller with the kids, obviously don’t do that. Not a good time and place to do that. I will be sure to do a quick recap. You can also go to the show notes at jenhemphill.com/69 to get everything that you need. Now, in today’s episode you’re going to learn what exactly consolidation is and when to consolidate. What not to do, what is not recommended to do with your federal student loans. You’re also going to learn the real deal behind the Obama Student Loan Forgiveness Plan and Jay gave this but amazing and huge tip on how to save you money on those student loans. So let’s not delay, let’s go ahead and continue on where we left off in episode 68 on our conversation with Jay Fleischman. [00:02:14.8] JH: So let’s talk, let’s say we have a student loan or we’ve had the student loan and it’s time to pay it back, what are your thoughts? When do you consolidate and when is it good, when is it just better to not do so? [00:02:27.1] JF: Okay, consolidation is only for federal student loans and it’s like a refinance if you ever had a mortgage. It involved taking your existing loan and swapping it out for a brand new loan. Now the difference between refinance and consolidation is consolidation is really just a swap of your loan. The balance doesn’t change, the interest rate doesn’t change, the only things that change are one, you’re re-amortizing your loans, so it’s a brand new loan. Second, if your original loan was taken out prior to July 1st, 2010, it may have been taken out with a private bank and then guaranteed by the federal government. Those loans have fewer income dependent repayment options than direct loans or the ones that are given directly from the government and so consolidation will take that essentially private yet federally guaranteed loan and turn it into a government originated loan, and that’s really one of two times when it’s helpful to consolidate. If you’re looking to get into an income dependent repayment option or one of the loan forgiveness plans that is only available for direct loans, then you need to consolidate that loan. Also consolidation is useful as a way to get out of default. So if you are in default and need to get out of default quickly because there are a couple of ways to get out of default, consolidation is the quickest way of accomplishing that goal, and those are the only two times that consolidation is a good idea. [00:04:07.2] JH: Right, okay perfect. That’s great. [00:04:13.3] JH: There’s so much to talk about. [00:04:14.6] JF: I know, but I’ve got to talk about refinance. Refinance is private loans. If you got a private loan and you to a bank and you swap it out for a new private loan. Or there are people who have a federal loan and they can actually pay off that federal loan with a new private loan. That I don’t recommend very often because you lose all of the protections of federal loans. For private loans though, look, if you’re going to qualify for a better interest rate and a better payment option, that’s a really good time to do that. But the reality is that many students, especially the younger ones, they don’t have the income or the credit that’s necessary to refinance a $50,000 private student loan. But those are the differences and I wanted to highlight them real quick. [00:04:59.1] JH: Awesome, that is great, great information. How about loan forgiveness? There’s different programs, there’s just so much to talk about, are you good on time here? [00:05:08.9] JF: Look, if you’re not going to cut me off I’ll talk until the cows come home. [00:05:14.0] JH: Okay, well I just want to make sure we give us much as we can. So loan forgiveness, tell us a little bit about the programs, how they work, what to look out for? [00:05:24.7] JF: Okay, do you mind if I get up on a soap box for a minute? [00:05:28.3] JH: Go for it. [00:05:29.3] JF: Okay, so a lot of your listeners may have heard of the Obama Student Loan Forgiveness Plan because you hear about it all the time in advertisements. It doesn’t exist. It’s not real, it doesn’t exist, it’s never existed, there’s no law, there’s no Obama Student Loan Forgiveness Plan. It’s a figment of our imaginations but it’s a really good marketing ploy and it’s a really good way to introduce somebody into what does exist. It’s a marketing hook, and I needed to put that out there because you have no idea how many times every week people call me up and ask me about the Obama Student Loan Forgiveness Plan. So I figured the more people who hear me say it doesn’t exist, the less often I have to answer it to somebody else and break their hearts. [00:06:21.6] JH: It makes sense. [00:06:23.0] JF: Okay, so there are however a number of loan forgiveness plans, short term as well as long term. Long term loan forgiveness exists at the end of an income dependent repayment plan for your federal student loans. So all of the income dependent repayment plans set your monthly payments at a percentage of adjusted gross income and different plans ratchet them anywhere from 20% all the way down to 10% and anywhere from 20 to 25 years of active repayment under that specific income dependent repayment plan. At the end of that income dependent repayment plan, any unpaid balance is discharged. So if you have not made enough money in payments and have not been required to make enough money in payments, and those payments by the way can be as little zero dollars a month depending upon your income and family size. But if you have not paid enough into your loans to actually pay them off principle one interest, then at the end of 20 or 25 years, the unpaid balance is discharged. And the way that the regulations are written now, the Internal Revenue Code, you get a 1099 at the end of that period of time for the amount of money that has been forgiven and you may or may not have to pay income taxes on that money. But that’s 20 to 25 years from now. There are exceptions, there are exclusions. I tell people not to worry about 20 to 25 years from now until, you know, call me in 15 years and we’ll worry about that at that point. Because we don’t know if that regulation is ever going to be changed. So with respect with taxation, that’s long term forgiveness. There’s also shorter term forgiveness. The big one out there is public service loan forgiveness. It allows somebody who is employed by certain what are called qualifying employers and pays certain qualifying federal student loan types for a qualifying number of payments to get a complete and total tax-free discharge and forgiveness of their qualifying loan at the end of a period of time. So break that down; it requires 120 timely, separate, agreed upon monthly payments on a direct loan while you are employed full-time by the federal, state, or municipal government or an appropriate not for profit entity. And so that’s what it’s required. [00:10:03.4] JH: You don’t qualify. [00:10:04.4] JF: Exactly, and that’s the thing that is getting so many people hung up. Because public service loan forgiveness, qualifying payments began as of October 1st, 1997. So people are starting to get real close to their 10 years and it happens a lot with teachers. Teachers were really the first ones to get hit to public service loan forgiveness and they all got into income dependent repayment plans and they all worked full-time for the school system and they’re chugging along. And they all come real close to the end of the line and they find out that their loans weren’t qualifying loans and there’s nothing you can do to un-ring that bell. You can’t go back and retroactively consolidate from a FFEL loan into a direct loan and that’s really what I’m seeing is hitting a lot of people really hard as we come up to the 2017 first availability of actual loan forgiveness. So right employer, not the right kind of work. Right employer, right payment plan, right loan, right number of payments, 120. They don’t need to be consecutive, you don’t need to be with the same employer the whole time. Each employer that you want to have your payment qualify for has to be a qualifying employer and so you can say work for the county for five years, make qualifying payments, leave county employment, go work in the private sector for three years. Come back to the county, you’ve got five years towards the ultimate 10 years’ worth of payments, theoretically at least and they’ve got to be separate monthly payments. So if let’s say your monthly payment under income repayment plan is $10 a month, you can’t cut a check for a $120 bucks and say, “Okay, that’s a year down.” That’s not how it works. Every month, you’ve got to make your separate on time monthly payment. [00:12:22.3] JH: Makes sense. So this is where you mentioned federal versus private loans and federal have some protections this is some of the protections that you’re referring to correct? [00:12:34.9] JF: Oh yeah and there’s more. [00:12:37.2] JF: Yeah, there’s more. There’s total and permanent disability discharge. If you’re totally and permanently disabled and can get that certified by a variety of means, you can get your federal student loans discharged. If your school closes within a certain period of time of when you attended under certain circumstances, you may be able to get your federal student loans wiped out. The list goes on and on and on. [00:13:02.0] JH: Right so is there a good website or a good resource that breaks those types of forgiveness programs down? Or unfortunately not? [00:13:15.2] JF: Yeah, well there are a lot of resources available. The US Department of Education is really doing everything that it can to put information together in an understandable way at studentloans.gov. So that’s really the first stop. I’ll show for myself, I’ve got a podcast, The Student Loan Show, studentloanshow.com. We talk about that too. I like the work that they do over at studentloanhero.com. I find myself referencing that site not infrequently for information that I can give to my clients. There are a lot of resources out there, those are really my top ones though. [00:13:55.3] JH: Perfect, awesome. Well that was enlightening right there and let’s say you are in school of course, you have taken school loans and you’re concerned about keeping those student loans manageable while you’re still a student. So you know they’re accruing, so what suggestions do you have to any student that is feeling that way, that is thinking, “Should I stop school and pay these off and start over again?” What would you say to that person? [00:14:27.3] JF: Go back to the basics. Figure out what your plan is and whether or not you’re on the road to achieving the goal that you set forth in that plan. If you have been on that road and you’re doing what you need to do to get to that end result, my recommendation is first, look at ways to cut your expenses. Maybe you’re at a four year college you’re living off campus and it’s more expensive than living in the dorms. Well, time to go back to the dorms. It’s going to cut your cost and it’s going to cut your reliance on your student loans. Maybe you’re going to school and you don’t live terribly far away from home but you just don’t feel like living with the family anymore. Well, move back home. That’s going to lower your cost. That little things like that really going to actually go a fairly long way. Cut your costs, your next step is look for opportunities to start making money. There are part time jobs that are available. They’re not glamorous, they are not glorious. I worked at McDonalds when I was in college, not for long but I did it. I came home smelling like French fries every night and I made some money. I did what I had to do. Look at ways at making money. Look at work study programs that may go to offset some of your educational costs off the top. Continue to look at scholarships because new ones become available every single semester. Just because you didn’t apply before you went into first year, doesn’t mean you can’t apply when you’re even second semester senior year and so those are some of the things that I recommend. [00:16:14.3] JH: Perfect and those, the same apply for, because there’s a lot of adult, those that maybe have kids and have been married that are in school now. And that advice that you just mentioned, I feel goes the same to those adult students, if you will. [00:16:33.3] JH: So okay, let’s say you’re done with school and it’s time to pay those student loan. So what is the best way, or I don’t know if that’s the correct question, on setting up those payments? [00:16:48.1] JF: Okay, so this is one of my favorite things because I do one thing and I recommend that people do one thing that nobody else is going to tell you about. Okay, ready? [00:17:02.4] JF: All right, cool. So when you come out of college, you get a grace period for your federal student loans and for the most part, it’s going to be six months. Six months when you don’t have to make any payments at all. However your federal student loans, some of them are still racking up interest and in fact, begin to rack up interest the day that you take them out. Those are what are called unsubsidized student loans. Unsubsidized Stafford, unsubsidized direct, you’ll hear them called a number of things, but unsubsidized student loans. Interest continued begins to approve from the day that you graduate. Then there are subsidized loans where interest does not accrue until you come out of your grace period. So you borrowed $10,000 in freshman year go through all four years of college or five or whatever it is, go through your six months’ worth of grace period. At the end of that grace period, you owe $10,000 on your subsidized. On the un-subs, accrues from day one and when you come out of your grace period, the interest capitalizes and what that means is that interest becomes principle and then you get new interest charged based on the principle of the loan. So let’s say it was a $10,000 loan freshman year on an unsubsidized loan, go four years, come out six month’s grace period, by the time you start making your payments, you probably owe somewhere close to 14 or $15,000 already. [00:18:53.1] JF: And you’re getting interest charged on that $14, $15,000 not on the $10,000 and that happens every time you go into forbearance as well. So here’s what I recommend: the day you graduate, the very day that you graduate, rather the next day because you’ve got stuff to do that day. The next day you call up your federal student loan servicer and they’ve sent you a letter already by that time telling you who they are, you call your federal student loan servicer and you wave your grace period. [00:19:31.9] JF: Get out of grace period that day and it’s got to be in writing but you can say, “You know what? Thanks for that six months, I don’t want it.” Now what does that do for you? Well, it puts you into repayment and you probably don’t have a job. You’re not making a lot of money at that point. If you come out of grace period immediately and you elect into one of the income dependent repayment plans, there is a strong likelihood that your payment for the first year, that initial certification period, is going to be zero dollars because it’s based upon your income from the prior year. [00:20:19.8] JH: Makes sense, very smart. [00:20:22.3] JF: So you get a year free and six months’ worth of your interest isn’t capitalizing. So you’re saving yourself interest on a going forward basis. So it’s either a 20 or 25 year repayment term, you knocked a year off of it for free. Your second year, you’re probably going to knock off a very low income also because let’s say you went to college for four years, you went full-time, you graduated at the end of May, which is when most people graduate, you’ve got no income for half that year. So when you re-certify for your second year, you’re actually using half a year that you probably weren’t earning very much, if anything, in your last year of college. So you get two years of pretty much no payments whatsoever or very, very, very low payments and that’s 10% almost of a 25 year forgiveness, 10% solid on a 20 year forgiveness. [00:21:21.9] JH: That is beautiful, thanks for sharing that. That’s awesome. I like that. [00:21:26.7] JF: No problem. The private student loans by the way, remember you don’t have any of those options. All the money that you’re saving on the federal student loans, you send that to the private student loan company. You’ve got to get rid of those yesterday, they’re bad news. So all that money that you’re saving, you’re not really saving it. You’re just reallocating it, so just bear that in mind. [00:21:55.0] JH: Makes sense, thank you. So let’s talk about, you’re the one that’s had these students and are paying them back and what are your tips for those that have kids saving for college? As we know there’s the 529, so the Coverdale plans, what are your tips on saving for college? [00:22:16.4] JF: You may not like this because I don’t quite know how you feel about it so I may be taking a counter position to you. [00:22:26.5] JH: It’s okay. It’s great to have different opinions, so that’s why I want to know yours. [00:22:31.7] JF: I’m not a huge fan of 529’s, I’m just not. I don’t know what my child is going to be doing for higher education, if there’s going to be higher education for my child. I don’t know what the lay of the land is going to look like by the time my kid is graduating high school. So I don’t want to plan for something that may or may not happen. 529 plans, there are only so many of them and so your investment opportunities are a little bit more limited than might otherwise be the case if you were investing your own money. I personally use the money that I think my child may need for college when they get there, I am investing it on my own. I know I am investing post tax money, but if they go to college, I’ll have the money available and if not, then I’ll have the money available for other stuff. And beyond that, as far as savings is concerned, I think that if you’re covering the full cost of college, first of all I think it’s great to come out of college and owe no money. I think it’s a beautiful thing, but I wonder if we’re not doing our kids a disservice by allowing them to punt for four more years on figuring out what they want to do and how they’re going to deal with their own financial lives. I think that the kids have to have some skin in the game as early as possible. That goes all the way back to when you start giving them allowance. They need to understand where their money comes from, where it goes to and how they need to allocate it. So they know how to function like an adult when they come out of school. Because I don’t know about you but I love my family but when my kid grows up and I have one so I say, child not children or kid, not kids. When my kid grows up and graduates from college, if my child wants to come home and live with us for a while, that’s okay. But I don’t want my child to think that they have no choice. [00:24:53.7] JH: No, I agree and I think it’s very important to raise them in a way, and I won’t get into it because we could continue this conversation forever. But we need to raise them to be as independent as possible and absolutely teach them all the money lessons that maybe we didn’t know growing up. So I definitely agree with what you’re saying just because we are in, at least our generation, I think we want to give our kids what we didn’t have. But in doing that we give them so much that they start to expect it or they can, depending on how you’re teaching them, right? But even after teaching them, I think a part of them, this is my witnessing my children coming just for me, I think they do. They just take it for granted to a certain extent so you have to keep on going back and talking about those things. So I appreciate all that you have shared Jay. This has been fabulous. There’s been a lot of good information. I think this is the type of episode that you probably need to listen more than once just to get everything or just take good notes. So let’s wrap it up. As you know, this podcast is about making money simple and taking control of it. So how would you finish this sentence: Her Money Matters because ____. Even though his money matters too, but let’s talk about her money, why does her money matter? [00:26:24.0] JF: Her money matters because money is power and she deserves to be as powerful as anybody else. [00:26:32.2] JH: Perfect Jay. I appreciate you being on and I will be sure to share your podcast because I think it’s a great resource. All the resources that you shared, this is going to be on the show notes, the resource part is going to be long and I’m going to share where to find you at and all that good stuff. So this has been great Jay, I appreciate your time and sharing all your knowledge with us. [00:26:54.6] JF: Thanks for having me Jen, I had a lot of fun. [00:27:02.8] JH: All right. So that is the second part of the interview with Jay and I hope that you got a ton of value from our time with him. I am going to do a quick recap in a moment but first, I wanted to do a quick shout out as always, as I love to recognize our listeners, our community members, and today’s shout out goes to Amy. She is one that has a background in finances. She’s actually an accountant and she really has an interest in personal finances. But what I really love about her that she’s in there, even though she may have all this knowledge, she’s doing well, she is in there supporting and she’s eager to learn and she’s curious and sometimes all it takes is the eagerness and the curiosity to take you a step forward, to help you progress with your finances. So Amy, thank you so much for being a part of our community, I enjoy having you there. Now, for the quick recap on today’s episode on the second part of the student loans. We talked about consolidation. That’s a word sometimes I have trouble saying, so fortunately I said it well the first time by a miracle. Anyways, on consolidation, just remember, consolidation is only for federally funded loans and with consolidation, like refinancing, it starts the loan over. So the time period starts at zero, okay? Refinancing is only for private loans and with refinancing, it can allow you to get a lower interest rate where with consolidation, they do this weighted thing. They take the different federal loans that you have and their interest rates and they do some sort of configuration of a new interest rate based on those interest rates. So what is not recommended to do with your federal loan? Remember, not recommend to convert it to a private loan. With federal loans, it gives you more protections than private loans. So just keep that in mind. And with the Obama Student Loan Forgiveness plan, as he says, it doesn’t exist. But here are the key resources to learn more and if you need clarification because with the forgiveness plans out there, it’s tricky. It’s not just cut and dry. You have to do your due diligence, you have to read on them, you have to understand them. So just keep in tune with the studentloan.gov website, there is The Student Loan Show, which is jay’s podcast, so definitely tune into that. And go on studentloanhero.com as a website, all those resources are listed in today’s show notes. If you’re not in a place to write that down, that’s completely okay. Just go back to the show notes at jenhemphill.com/69. Now, the big tip that I thought was so fabulous that he gave on saving some money with your student loans is, after you graduate, call the servicer of your loan and wave your grace period. Of course remember, it puts you into repayment but you elect the income dependent repayment plans. The payment will be, especially if you just graduated and don’t have a job aren’t making any income necessarily, then chances are the payment for the first year will be zero. So that’s a way to save money. So keep that in mind. That is just a quick recap by all means, if you need to re-listen to the episode, I would do so. Take good notes, especially if you were out and about because he gave a ton and ton of information. Join us in the Facebook group if you haven’t already. If you questions and especially if I can answer because I am not the student loan expert, I can definitely get Jay to answer those questions for you. Now, the other thing I wanted to remind you on is, if with your money, if you’re not clear, if you don’t know what’s coming in, what’s going out, if you’re at the end of the month, you’re thinking, “I don’t know where all that money went,” right? Just make sure you grab nine mini guide and my Jump Start Your Money mini guide is going to help you take that overwhelm of figuring out where all that money is going, also, there is an episode that I did that really takes you by the hand and guides you step by step on how to use the mini guide, and it’s free so by all means, why not? You can get that at jenhemphill.com/miniguide. So that is a wrap. I really, really want to thank you Jay for joining us, sharing all such good stuff and getting to know you. You can check out the show notes, as I mentioned before, on where to find Jay, tune into his podcast, all that good stuff at jenhemphill.com/69 or 68 as well since we did two episodes. So thanks again for joining me and I will chat again with you next Thursday.